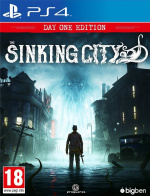 It doesn’t reveal a fat lot about Frogwares’ Lovecraftian adventure game, but this cinematic trailer for The Sinking City sure sets the scene strongly. The three minute clip shows the private investigator protagonist slowly succumbing to insanity, as all manner of Cthulhu-esque creatures haunt him. It’s an awesomely unsettling video, we just wished it told us a bit more about the game itself. All in good time, we suppose – it’s due out on 21st March. Definitely keeping an eye on this one. So far it seems a bit like The Evil Within but with Lovecraft. @alphadrago5 The gameplay itself is going to be like the latest Sherlock Holmes games, since it's the same developer and they have anounced that it will be an "investigation" Adventure game. I'm really looking forwards to this game. A great Lovecraft-based game needs to be a classic Adventure game, not action or other. It needs the slower pace, with immersive atmospheres, solid narrative and good characterizations. The developers are really good at these things already, so I have little doubt I will get what I hope for: a good Lovecraft story and environment, with the gameplay of 'Sherlock Holmes: The Devil's Daughter'. trailer was like a mix of evil within and silent hill. and it's good that it plays like a investigation sherlock game,less shooting etc results in more focus of adding the creepy and horror story that often is just average in action horror games. @jdv95 @Bonbonetti @alphadrago5 @playstation1995 Agreed guys loved the trailer, can't wait to see some actual gameplay. @get2sammyb You should prob fix the release date btw, says 2018 instead of 2019. @jdv95 I was referring to the "blue game info box" on the "top/middle right" of the screen, it still says 2018 there. @KidBoruto oh i know that,but i added that link because it has gameplay that you wanted to see. @jdv95 Oh derp gotcha, thanks for the link! @get2sammyb No problemo, glad to help.